Does your PTO or PTA take payments by credit card? If not, it’s a step you might want to consider—accepting credit cards can significantly increase your income. Taking the step might seem daunting, but this electronic payment guide will help you understand the benefits and risks, the how-tos, and the costs of credit card processing. Are you ready? Accepting credit card transactions is a step up on the sophistication ladder for a parent group. If you’re thinking of making the transition, here are the factors to consider. How it works. Nuts-and-bolts information on mobile app credit card processing, website payments, order form sales, and much more. Getting started. Everything you need to do once you’ve made the decision to go digital. Financial controls and best practices. Good controls help protect your customers and parent group alike. Here’s what you need to know to minimize risk. Sample forms from our File Exchange to make things simpler. 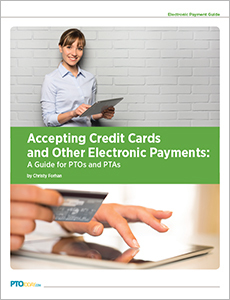 Download the full Electronic Payment Guide for free. Still have questions? Call us at 800-644-3561, we're here to help.